Tenant in court is safe (for now) – but why is Leeds Council persecuting tenants? 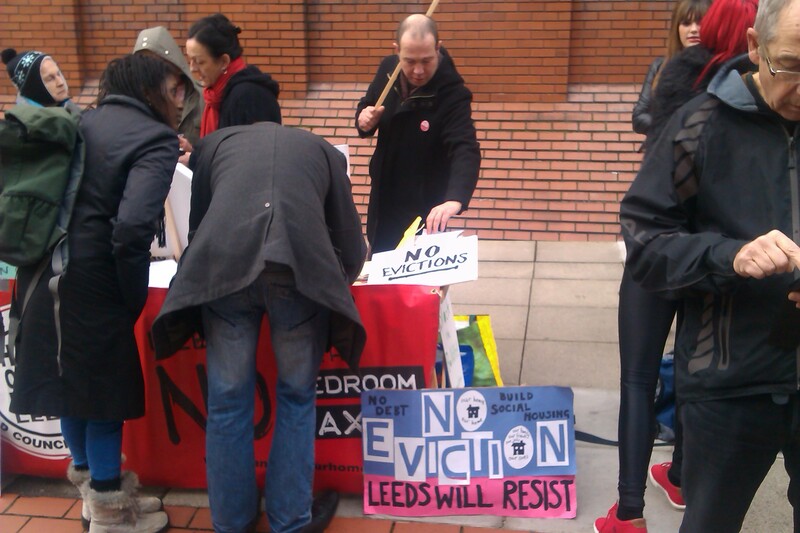 Around 20 people gathered outside Leeds County Court for 2 hours yesterday (28th Nov) morning while we waited for a Leeds woman affected by the bedroom tax to have a possession hearing (which could potentially lead to her eviction). In this case, the possession hearing was adjourned for at least 2 weeks. This is because the tenant is challenging a decision by the council NOT to give her Discretionary Housing Payment (DHP). Because she has asked for a review of the decision and the next hearing will be when that decision has been reviewed by the council. We will continue supporting her and other tenants, whatever happens and whatever decision they make over her housing. Council leaders Peter Gruen and Keith Wakefield never miss an opportunity to tell us and the media how they are doing everything they can to help these vulnerable people. They would appear to be repeating this story to their friends; following lobbying of our local MPs before a recent Parliamentary debate, Leeds North East MP Fabian Hamilton wrote to one tenant saying “I have been assured by Council Leaders that there will be no evictions as a result of the Bedroom Tax”. Sadly we have to judge our leaders on what they do and not what they say. On two Council “possession days” at the County Court, tenants have been in court due to bedroom tax arrears. We are speaking to a number of council tenants who have received a letter giving a notice of intent to seek possession – the first step on the eviction procedure. However, the tenants we have helped or been in contact with so far, cases have simply been adjourned for further “enquiries”. No possession orders have been made and people are still in their homes. All this is at a cost to the council. Each time court proceedings are commenced, they must pay a court fee and legal costs will be added for the paperwork and for a solicitor to attend each hearing. We know that for each possession order obtained the cost to the council is over £3,000. Proceedings do not make economic sense. This money could be better spent writing off arrears or for making discretionary housing payments to really help the vulnerable. So why bother – unless it is to try and frighten the vulnerable into paying? We believe our campaign can win and tenants can be protected. If you are affected and have a Court date or if you know anyone who does then PLEASE contact us and we will help prepare with you for court dates. The earlier the better! Also please read our advice here. If you’re interested in helping the campaign, please get in touch via phone, email or Facebook and/or come to our next meeting at 7pm on Weds 4th Dec, TUC Centre, 88 North Street. Yesterday’s court support by tenants and other Leeds folk shows that if we stick together, we can win! ← UPDATE: Demonstration, report and more!